September 2010 | To Be, To Be. Tutubi. 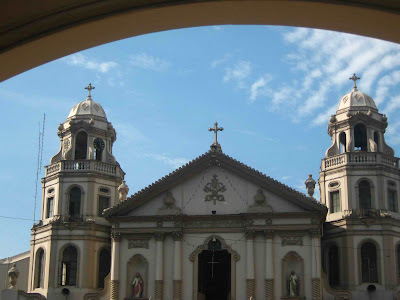 This is the Quiapo Church in Manila. Its is known as the Basilica of the Black Nazarene and devotees flock to the church every Friday. You should see the sea of people every January 9 to wonder at the devotion of so many people. But I love going to Quaipo for more than just the church. There are lots of things to buy and see. Everything you could possibly need can be found here. You can buy school stuff anytime of the year but before opening of classes, the prices are so low! It is also an Ukay-ukay haven, selling used clothes very cheaply for P10! You can also have your fortune told for a fee! 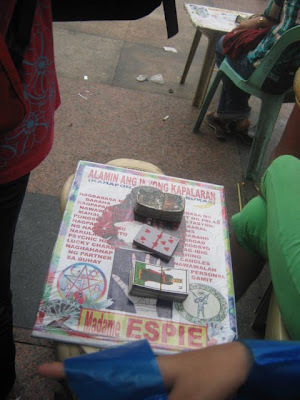 There are also vendors of medicinal plants and abortifacients just beside the church. I cant take their pictures because I fear they wont let me! yes, the irony is not lost on everybody. There are food: vegetables, fruits, local delicacies and a lot more! 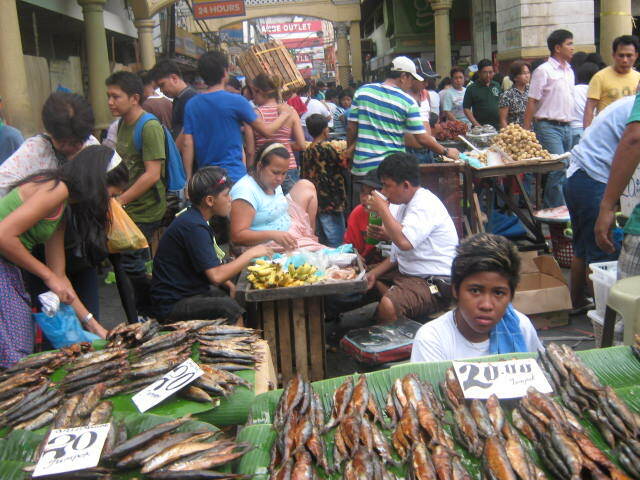 I love Quiapo and this is just one of the best places to visit in my country for an authentic Filipino cultural experience. Taken at a resort in Laiya, Batangas when our department had its teambuilding and planning session some years ago. 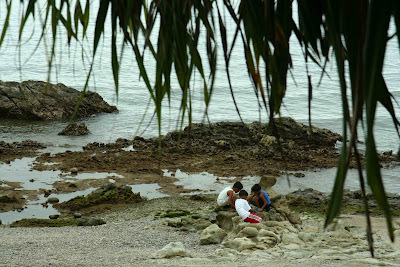 This area of the beach is rocky but there are prett corals and fish to see. This is a nice place for relaxation because its quite and peaceful. 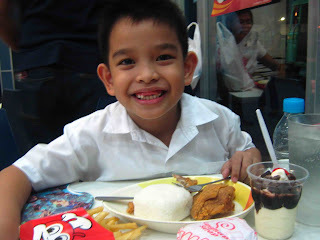 If its snack, it has to be, Jollibee! This was actually my treat to Danniel after his recognition day last year. I told him to order everything he wants and he did! He didn't finish all of it though. He left the fries as pasalubong to his siblings. And here is Ishi with one of her favorite snacks, ice cream! 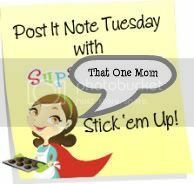 Children are so easy to please and they are already very happy with these simple treats! Of course, these are not their daily diet, ha ha. 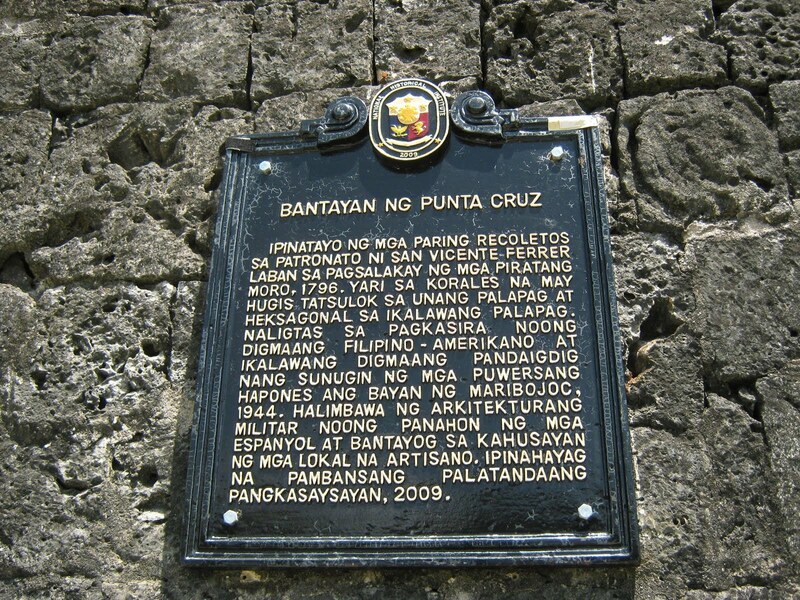 Ito ang Bantayan ng Punta Cruz sa Bohol na ipinatayo laban sa pagsalakay ng mga piratang moro. Napakaganda ng arkitektura, at ang kapal ng mga bato. Kung gumawa sila ng walls na ganito kakapal, malamang ay walang sinuman ang makakapasok para manakop sa atin! 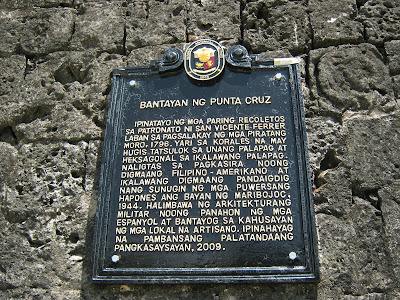 Eto ang harapan ng bantayan. Ang ganda talaga ng anggulo nya. At ito naman ang kuha mula sa likod nya kung saan naruon ang dagat. Ang ganda rin ng tanawin sa dagat. Namiss ko ang LP. Sana ay bisitahin nyo din ang iba pang lahok ngayon linggo. 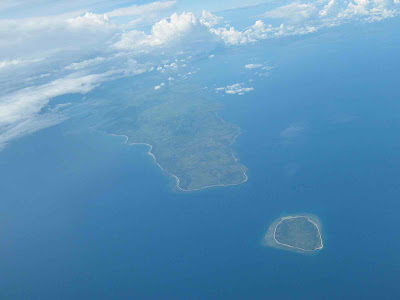 This picture was taken last June 2009 while we were aboard a flight going to Bohol Philippines. In this photo, you cant tell where the land ends and the water begins. That island below in on the map, but I cant tell which one! Ha ha! I know I will draw some criticisms from this post, but I am sick and tired of hearing about the illegal gambling game called Jueteng. It has been on the news lately and even Archbishop Oscar Cruz is on the way to expose the brains behind the game. 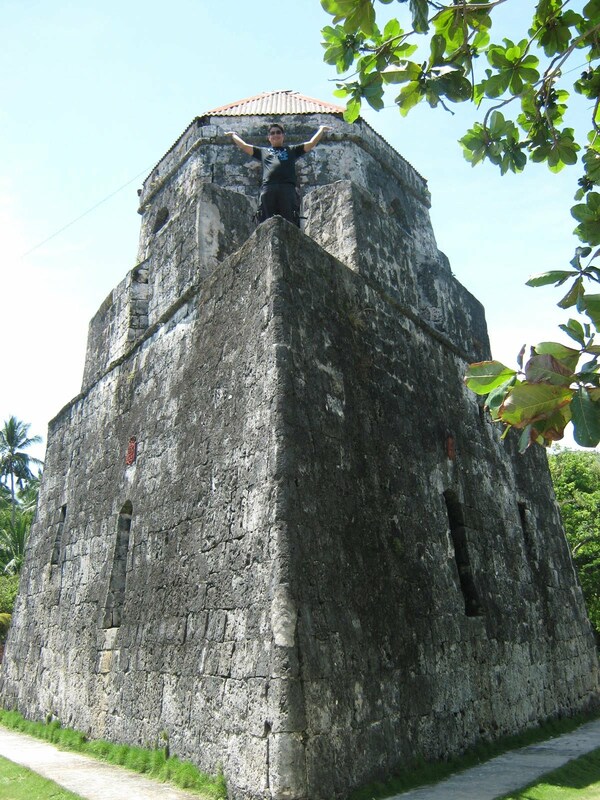 When I was still a child in Batangas, Jueteng was already flourishing then, and it has been flourishing even now. I don't know why they wont just legalize the game when the government even have an exact game like it: small town lottery. Now, it is being said that STL is being used as a front for Jueteng so why not legalize it already? This way, the government will have another source of income and they can get rid of the corruption. The problem, I know is that the church and a lot of conservatives are against legalizing it because they say that you make the poor gamble when they should be using it to buy food. But why did they allow Lotto then? I don't know about this argument, but I say that you let the person decide what to do with his money, as long as it is his money to spend. I have never tried gambling online, but I am not against the idea and I do not judge those who enjoy this because it is their money, their time and their choice. I even love to try those online casino slots and try my hand sometimes. If I ever get to Macau, visiting a casino would be on my list as well. I guess I just do not frown down upon gambling as much as some people do because I know myself and my limits. So I hope you can understand why I personally think we should just make Jueteng legal if they cannot eradicate it at all! These sofas are the only things left from our house last year when it was ravaged by typhoon Ondoy. Here they are, pictured below last year. I bought them almost brand new from my boss who moved out of her condo. I refused to throw them away, even after we have disposed of the TV, the DVD player, the speakers, the electric fan, clothes and everything else. Well, they are so big and we cant just leave them on the sidewalk anyway so I thought we might as well just keep them in the house, wash them and let them dry. And that was what we did! They look okay now, save for the dust. 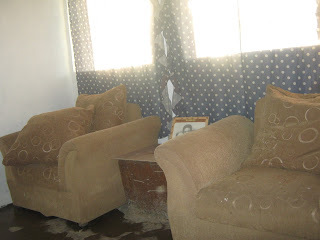 Of course, the sofas are still dusty and a smoke of dusts comes out whenever we sit on it. I am thinking of hosing it down with water again or vacuuming it to take out the dust from the dried mud inside the sofa. I know its not very sanitary but we only stay at the house to visit and do stuff on weekends so I guess its okay. Call me sentimental, but I want the sofas to be a reminder of how we survived the flood and how we are slowly trying to rebuild our house. I remember saying on this blog that I love receiving handwritten notes and messages more than I do getting a text or an email. I am perfectly thrilled whenever my kids would give me a mother's day card. I still have them on display at my desk at the office and it really gives me a happy feeling whenever I see them. I feel the same way about holiday cards. Of course, I also love receiving gifts but the ones who take time to enclose a small personalized greeting always gets my love. I also try to do this as much as possible, not just for friends who are abroad. Even for my friends here, I always write a small note and hope that they appreciate it as much as I enjoy writing the note. There is also a big difference between receiving a holiday email greeting and a handwritten card. A card is more tangible and more heartfelt for me than an electronic mail. Of course, some would say that it is best to appreciate that you were remembered, be it by email or by cards and of course that is true. But I still say that I would always love being the recipient of a handwritten card more than anything! Its still three months to go before Christmas but we can all feel the season already. Whenever we are at the malls, we can already hear Christmas carols playing and we are reminded that we need to shop early to save money. There are lots of ongoing sale now and even bazaars are already sprouting everywhere. But for those who cannot physically go to malls to pick gifts for their friends and loved ones, online shopping is a great option. I personally prefer this when buying gadgets because I can save money using this Orbitz coupon, a Dell coupon code or a HP promo code. My sister who is in second year college wants a laptop and although I am not yet sure if I can afford it, I hope that I can actually buy one with all these savings. I also want a new camera for myself because my old one is acting weird already and I hope I can also find a good deal online on the camera. Other than those gadgets, the rest of the gifts I plan give my family and friends I plan to buy from the malls unless I get more coupons and promo codes. ... ice cream cake! We just had this mango flavored ice cream cake during my friend, Vangie's birthday lunch last week but I want one right now! This product is so good, there is no need for any more special ads to make it known. This post should be enough to make your mouth water and crave for it as well. This sells for less than 500 pesos and it is really good. 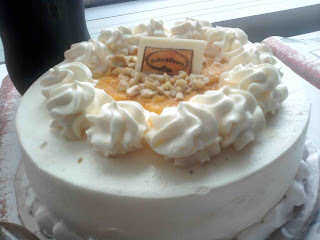 Inside the cake is the mango flavored ice cream which is really good. We bought it at Robinsons Supermarket and if you want to bring this home, it can last frozen for 3 hours. The brand is Bake and Churn and they have a booth outside the supermarket. 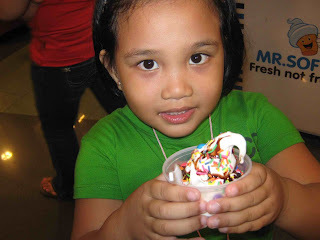 Other than this ice cream cake, I also want Leche Flan, Halo-halo or Mais con Hielo. My place of work is very near the mall so I can really just go and get any or all of these. Good thing I can blog about this to get my mind off buying. I just hope nobody gets the same cravings; otherwise I will be on my way to buy one right this minute! Or maybe, since I am forever on a diet, I will just drink tea. Hay. My kids are are blessed to have two wonderful and loving grandmothers. 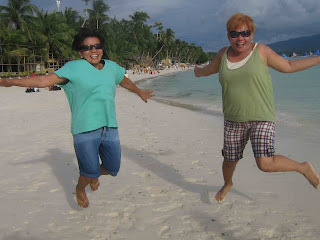 They are pictured below having lots of fun in Boracay last July. We really had a blast, and my mother-in-law even forgot to call this Self Storage Ipswich that her cousin asked her to arrange the storage of their mother's stuff. But who cares, they were there when we got back. Anyway, so its obvious that they had fun right? In the picture below, my mom is the one on the left and my husband's mom is on the right. We live in a compound and my MIL is our neighbor. My mom lives with us and helps us with the kids. She also sells barbecue at night and that helps a lot with our finances. 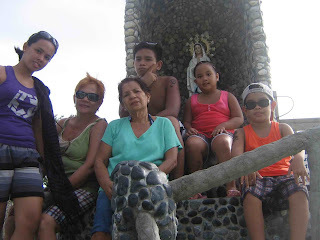 My kids are very close to their grandmothers. Unfortunately, they have never experienced having a Lolo. My father died when I was in high school and my husband's dad died some years ago but he was not living near us. 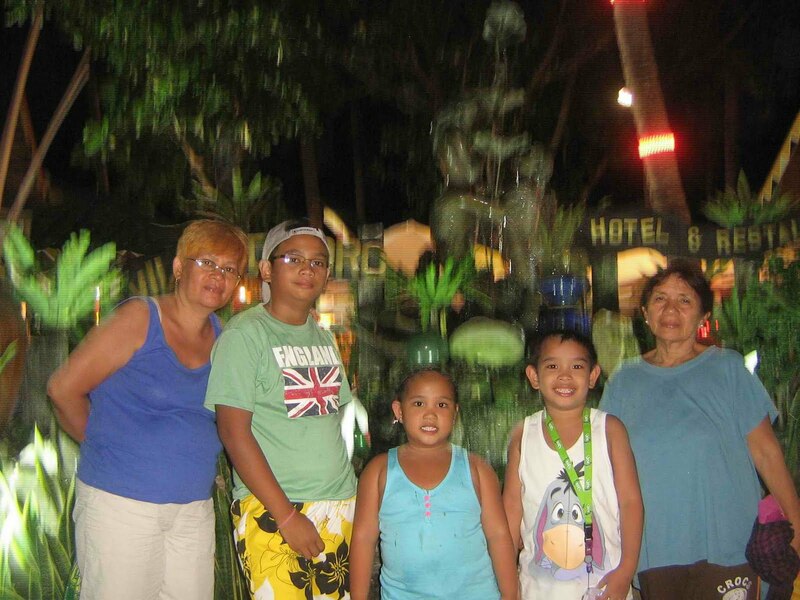 I know that the love of their grandmothers are enough for my kids. I envy kids and their imagination. 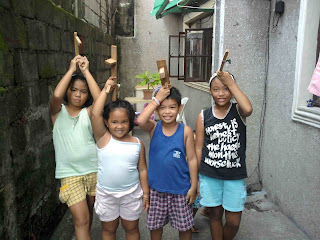 They can invent any kids games with very minimal effort and play tirelessly. In the picture below, my kids and their cousins used scrap wood and rubber bands, and voila, they were ready to play cops and robbers! This game took the better part of the game and they were tireless. The adults watching them were both amused and envious at their energy and enthusiasm. I was like that when I was a kid of course. I could spend all day playing and complain endlessly when my mother would tell me to clean up or take a nap. Those were the joyous days of my childhood and they seem so far away already. Good thing the kids are there to remind me to take time to have some fun! 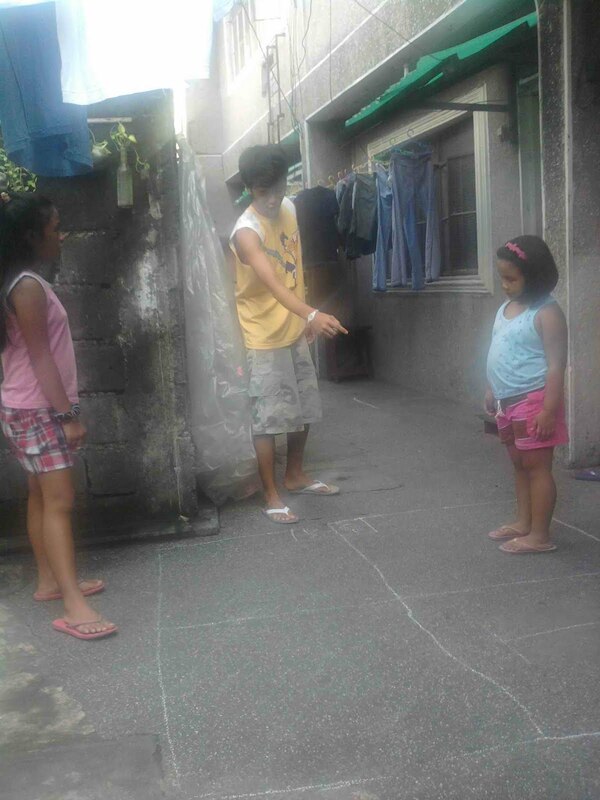 In this picture below, my nephew Ehxcel made them a game of Piko where they jump from one side to the other. I used to play this when I was kid and I can remember correctly, I was the reigning champion on my street. I beat all the kids my age at this game. But now at this age, I can barely jump from one side to the other without having the kids laugh at my face at the effort! How I wish we adults can find it this easy to have fun! My husband and I are weekend warriors. We are currently renting a house in Quezon City, but we have our own house in Montalban. We go there most of the weekends to supervise the construction or to do things ourselves. This weekend, we will go there to paint the house with primer. We were there last weekend to apply concrete neutralizer and to clean up a little bit. There is not enough money yet to do all things at once so we prioritize what needs to be done. First on the list are the tiles for the restroom and the kitchen and the kitchen cabinets of course. I saw this nice cabinet doors and I already know that this is what I want for my house. Since I want to save money and my carpenter may not get the design exactly, I need to ask for wholesale cabinet doors. There are unfinished cabinet doors that are cheaper but I am not sure that I like them that much. As much as possible, I don't want to comprise what I really want just because I want to save on the money. This is going to be our home anyway. Still, what I can save I can use to purchase that dining set. Hmm, what do we do now, weekend warriors? I guess we need to think about this very hard. 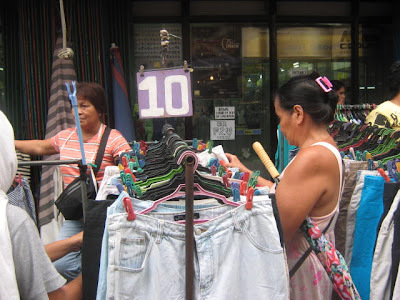 Its never too early to start Christmas shopping and I am now checking out sale at department stores and bazaars. Not only am I looking for gifts but my eldest kid asked me to find him a Green Laser Pointer that he will give to his friends. I need not remind him that it is bad when pointed directly at the eyes because he beat me to it. He said they will use it for a dance number during their intramural. So I guess I should be off hunting, right? On another note, it is good to know that morning TV shows are now giving safety gift giving ideas and age appropriate gifts. You wouldn't believe some gifts that my toddlers used to receive. Its like the giver does not wish for him another Christmas, seriously! There are also items being smuggled into the country which did not pass our safety standards but are being sold at ridiculous low prices in bazaars. While I am one for saving money, I cannot in my conscience buy gifts that could harm our kids. I just hope that other mothers will also take note to check the gifts that their kids may be getting if it is safe for their health. So, happy Christmas shopping everyone and always stay safe. Okay, this is just a dream so please indulge me. I want to leave my earthly possessions to my three kids and my remaining family and since I have lots of properties, I would need the services of an Austin Probate Lawyer. I also properties all over the country and around the world! But seriously, I don't know what happens when common people like us dies and we have no last will on how our properties are to be divided. Since I have seen how families get destroyed because of this confusion, I vow to make it easy for my kids. Instead of leaving them one house, I will try to buy three houses, one for each of them. I will also buy three cars, three vacation houses and three of everything so they wont have to fight over anything. Should I have cash and other liquid assets, I will ask my lawyer to divide everything into three, up unto the last centavo. And if I have no property to divide over the three of them, I will just try my best to shower them with the love of a mother to last them a lifetime and beyond. Now, that is a more realistic and plausible plan. So I tried being nice yesterday and all I had to show for it was this big, bad headache! Really, my body was telling me that one cant be that nice and not suffer a physical manifestation of the futility of the exercise! I guess I have to hire a Personal Injury Attorney Austin if I am to continue being nice. Some people really cant be bothered to read emails, check details or even be professional anymore. 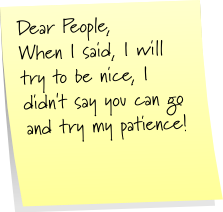 And while one tries to be nice, I don't know why, but it seems that more people are just trying your patience. I tried being as professional as I can be and point errors in a nice and diplomatic way, but it seems all of it was just wasted. 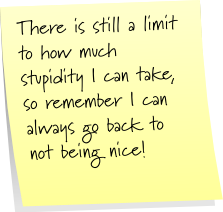 I tried being more accommodating than usual, but some people has a year's supply of stupidity! I have to submit that there are instances when it is no body's fault and things really can just go bad on its own. So when that is the case, the only thing to do is find a solution and move on. And you would think that those people who have a record of stupidity would be the first ones to do just that right? But no, they have the gall to look for somebody to blame! Okay, I rest my case. I will try to be nice and wont let these people bother me anymore. But woe to the person who tries my patience one more time! I am not a girly-girly type of person. My husband said I was a tomboy when he first met me, and took that as a challenge to turn me into a lady. I let him believe that he succeeded and made me a real woman, ha ha. But truth is, I am an independent woman, capable of doing things and I usually find myself with a lot of things to do. So there is little time for me to go to a spa or a salon to get a haircut, a manicure or a pedicure. But this weekend was different! I had some mommy pampering time! Well, we went to our house and did a little work on the cement. We primed it for painting next weekend. Then after cleaning the house, we went home because we were attending a party i the evening. When we got home and I had a long, luxurious bath complete with this unique bath and body scents, I saw the sorry state of my nails. There were still caked mud under the nails and the paint, well the paint in my walls looked better! Since I had no more time to go to a salon for a mani, pedi and foot spa, I had to call our neighbor for a home service. And now my nails look lovely! 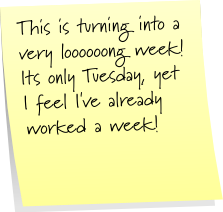 Now I know that I have to do this pampering weekly! I feel so girly! Tomorrow is a holiday in the Philippines in celebration of the Feast of Ramadan or Eid'l Fitr. And it means, my kids can stay up as late as possible to watch TV. And since we don't usually enjoy the same shows, I will just check out Free TV Online. My kids would surely be watching comedy shows but I would like Glee or How I Met Your Mother. My husband would prefer to watch basketball or the live billiards tournament coverage where some Filipinos like Efren Bata Reyes are competing. Good thing that my sister does not care much for TV and would rather read a book. It means lesser competition, ha ha. But lest you think we are TV addicts, my kids don't stay up too late during school nights. They are in bed before 10 pm and are up at 5am. That is why I allow them some TV time during Fridays and Saturdays. They don't stay up that late though. I guess the latest that they could stay and watch would be until 11pm. But they are still up at 7am even when there are no classes. But I would not discuss the TV watching habits of my husband here because that would require another post. 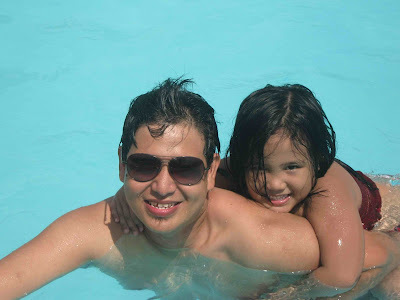 I just love this picture of my husband and daughter and I am sharing this for today's Watery Wednesday. I read this line from a book somewhere, "you can find something truly important in an ordinary minute" and would have to agree that this is true. In the same breath, you may find yourself in an accident in an otherwise ordinary circumstance like commuting to work, crossing the street or walking on the sidewalk! That was what happened to this other motorcycle we were following just this morning. His passenger was his young son who was on school uniform and it was obvious that he was dropping off his son to school on his way to work. Then this Jeep just cut him off and his motorcycle hit the jeep and he and his son fell. Good thing he was driving slowly and both he and kid had their helmets on! As a mother, I felt my heart literally drop as I witness the danger they were both on! Luckily, the father lifted his son who seemed to be shaken but not hurt. My husband and I stopped and asked them if they were alright and then called a traffic officer! While we were on our way, I told my husband to check out this Car Insurance Los Angeles and see if there is another one near our area. I was still shaking that time and I know that with just a slight change of timing, that father and son could have been us! Accidents do happen really and it was a scary thought! I love Real Living Magazine but I don't have a subscription so I always buy back issues. We have a subscription here at the office anyway so I don't need to buy the new issues right away. One of the main reasons why I love the magazine is because of the real life home makeover. If I have been living in my own house for two years now, instead of renting at my mother-in-laws, I would have joined their makeover contest! One of my favorite issues is this one house which is I think just the same size as mine. I love the Dining Room Chairs that they gave the winners, aside from the free makeover of course. I kept the copy of that issue because I want the cabinets, the paint, the lighting and almost everything. I want to have my carpenter copy the cabinets and the kitchen design, and the painter to copy the paint job. Good thing the color of my house is the same as the house in the makeover. I am still looking at more issues of real living for their do-it-yourself tips and more house decorating ideas. Just recently, I saw this hanging lamp that I liked and when I checked out the price in Handyman, I was so happy because it was within my budget. So expect me to check out more Real Living magazines for more of these! I have always believed that grandfather clocks are family heirlooms, good enough to be passed down from one generation to another. Unfortunately, I have yet to see one grandfather clock in real life. I have only seen them in movies and on TV, would you believe that? So when I saw some howard miller clocks, I knew it was a sign that I should start a family tradition and buy one for my own! The problem is, I am not sure if it will be a good fit in the design of my house. Another thing is, my kids often see grandfather clocks in horror movies. These clocks always signal the arrival of the vampire or the villain or of darkness and they might associate the clock with such? So how do I erase their impression of a grandfather clock? I guess I should just bring them to the store and ask them to help me choose. Being part of the selection process might make them appreciate the importance of the grandfather clock. Making the selection a family affair will also associate the happy memories with the clock. As for the design not fitting the house, I guess I have to choose the closest one possible! I dream of High Speed Internet! I live in a third world country and I am not ashamed of that fact. I love the Philippines and I could not imagine myself living anywhere else in the world. But there are times when you just wish you were living in a first world country and enjoying the services of a wild blue high speed internet. My Internet connection at home has been intermittent, to say it kindly, for a week now! I have reported the problem to my provider but all that they could promise me is that they would check, and get back to me. So far, I have been using the free wifis at malls and at Internet cafes for important online stuff, but I still dream of high speed Internet at home. Yes, I dream of it and wish that my government can find a way to provide its citizens with high speed Internet as a matter of right. My friends who have been abroad are amazed at the service abroad and can only wish the same for us here. If only that transaction between the government and a foreign Internet provider was not mired in controversy and corruption, then maybe we could have been enjoying a high speed Internet now! I am one of those old fashioned people who are still very thrilled at receiving Christmas cards. I love holding them in my hands and seeing the handwritten greetings of people that I love. I also love receiving postcards from my friends abroad and sharing in their excitement at having visited a wonderful and new place. I think that I am with them in their thoughts while they were enjoying a beautiful place. Now when I think about these two things that I like, I realize that these could be made into a wonderful Christmas gift. 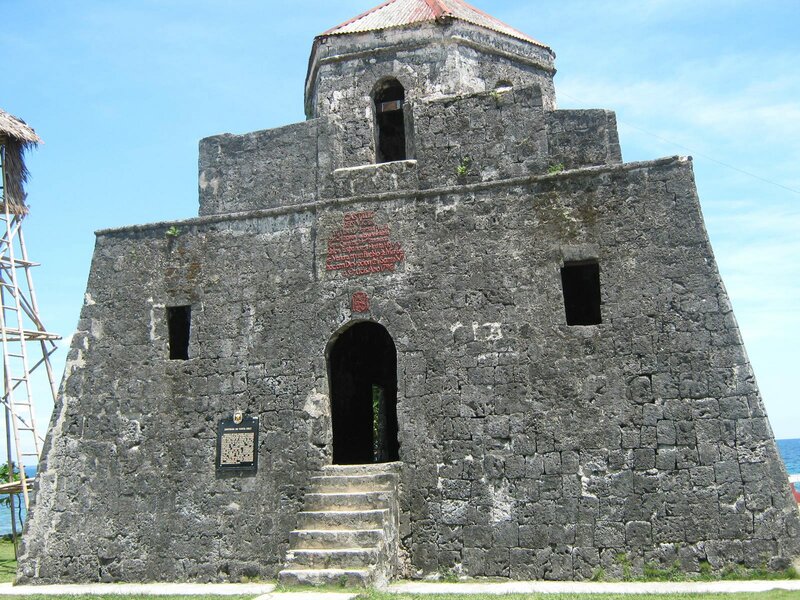 I would ask a postcard printing service for personalized Christmas postcards of wonderful places in the Philippines! Since we have already visited Boracay and Bohol and would also go to Palawan soon, I would make them and send to my friends in other countries. I am sure they would appreciate the effort and the personalized touch. It would also be a good way to showcase and share the beauty of our country and hope that someday they could come and experience it. In this day of electronic age, I am sure there are still people who appreciate receiving personal notes from friends to touch their hearts and life. Its is budget time in my company and I cringe at the sheer number of paper we are using now to print the necessary copies. We have a recycling policy so we reuse papers as much as possible, but I can still feel the number of trees we are killing so to speak. Even when I go grocery shopping, I ask the bagger to limit the number of plastics to use in packing. In this way, I know that I use as little plastic as possible. At home, we also reuse plastic food containers and milk cans as planters for the garden. We also use plastic bottles for hanging plants. The local school also requires the kids to bring recyclable materials weekly. This way, they are made aware that not everything has to be thrown into thrash right away. I was also glad to have found out that recycling electronic components already exist for use of big companies. It means that even big businesses are aware of the importance of recycling and are working to help save our planet. I just hope that all our efforts are enough to extend the life our dear planet. So let us all do our share and reduce, reuse, recycle! 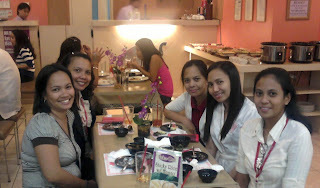 We had lunch at Thai Kitchen last week with friends just because we felt like eating out for a change. Our office is located very near Robinsons Galleria so we just to get down from building to eat out. 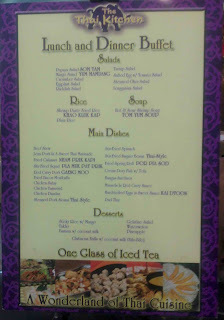 We chose Thai Kitchen because Mr. Choi's was full and we didnt like to wait. 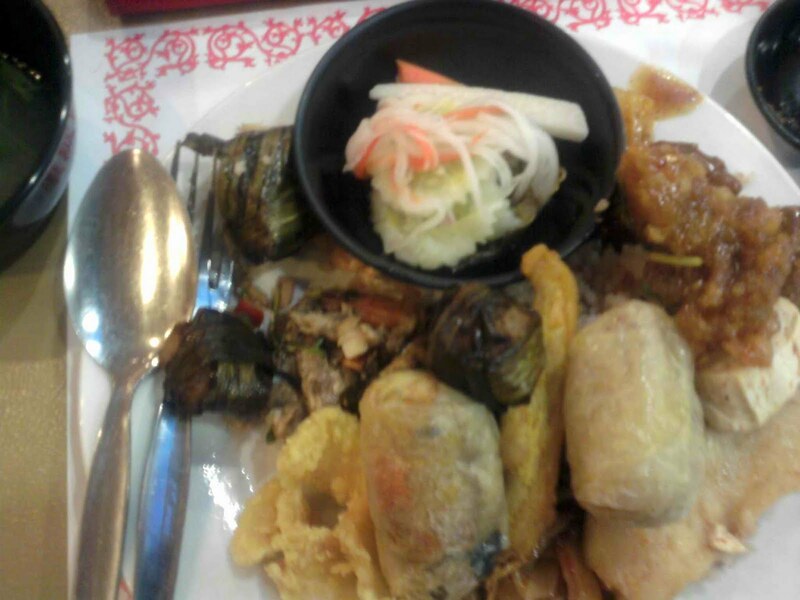 At Thai Kitchen, we tried the P250 per head buffet. The salad was good, but there were very few choices. This was my plate. Since they have a no-left over policy, I was forced to finish them all, ha ha! It was okay but very remarkable. If you ask me, I will not eat there again because there was nothing special about the food. 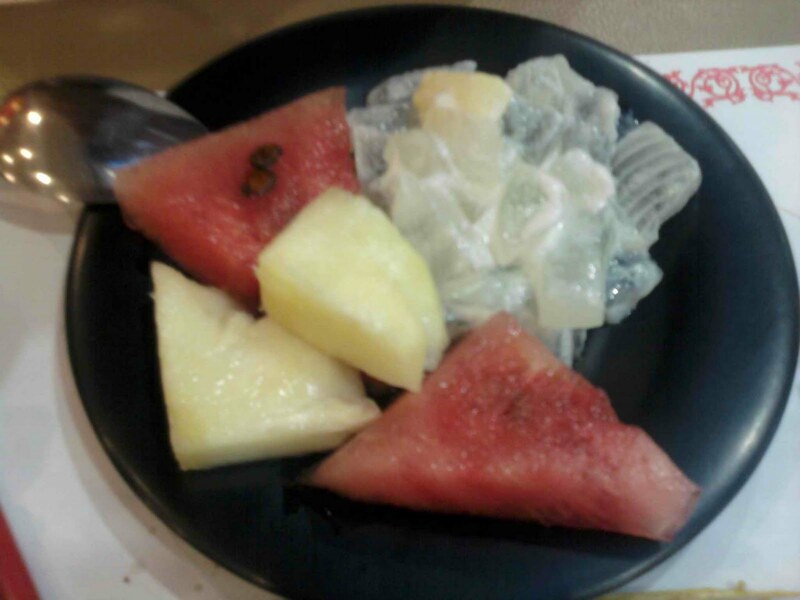 The desert was just 2 kinds of fruit and three more delicacies. 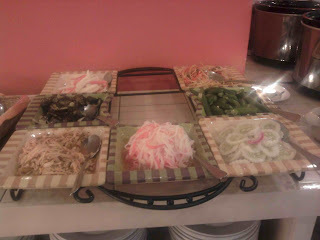 The food was okay, but the company of friends was great! 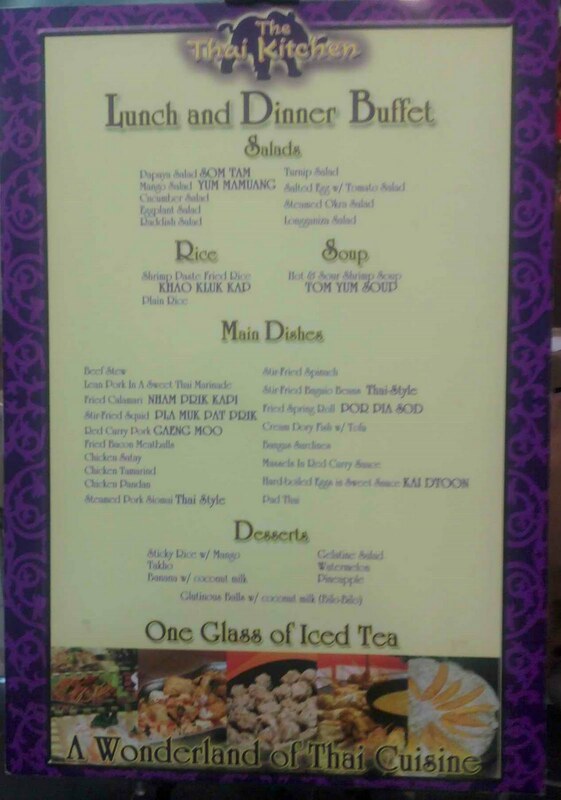 Have you tried Thai Kitchen? How was it for you? If you ask me right now, this very moment, what I want for Christmas, I would say I want a mommy makeover. I love my body and I do mean not to give you guys ideas to the contrary but I believe that one must always be open to improvement. I exercise regularly and I try to eat properly but we cannot discount the age factor on how we look. A California tummy tuck sounds good too but I don't think I have a need for a Los Angeles breast reduction just now. As long as these procedures are done by refutable doctors and clinics, then I see no real problem. Of course, some would disagree with me and say that these procedures are too invasive and too expensive. I guess if one is not informed and is not aware of many good clinics then they could very easily say that. I would have to say that beauty has its price and one must be willing to pay the price for it and that's a fact of life. As long as I its my own money I am going to spend for something that will give me personal satisfaction, then I would go ahead and do it. Again, as long as my health is not going to be in danger, then this is an option. I would love for my kids to have new experiences and to get to try new things. So when he said he wanted to ride a train, we were off to Baclaran so he can try the LRT. 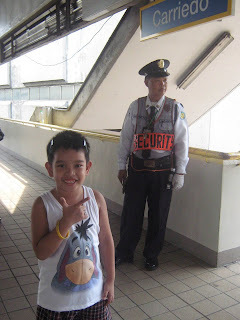 And here he was excitedly posing with the Manong Guard at the Carriedo train station. He was asking a lot of questions like what are the rocks on the train rail for, why are there fines when you go down to the rail and a lot more! He was really happy with his first train ride. 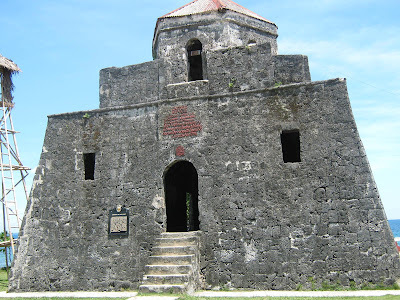 I like to try new experiences as well and one of those on my list is to climb Mount Pinatubo. We are hoping to schedule this early next year but I am already saving up for a La Sportiva Hiking shoes. One must be sure to have the right gear when climbing a great mountain! Finally, Palace made the announcement that September 10 is a regular holiday in observance of Eid'l Fitr or the Feast of Ramadan. You may check out Proclamation No. 26 for the full details. For guidelines on your holiday pay, check this out. My six year old daughter is on the heavy side and I encourage her to do lots of physical activities and play. Here she is with her jumping rope showing off some skills. It is so funny watching her because she can't really jump. She would jump, then step over the rope, then jump again! I had to show her several times but she still can''t get it. I guess her hand and feet coordination has to be developed more. 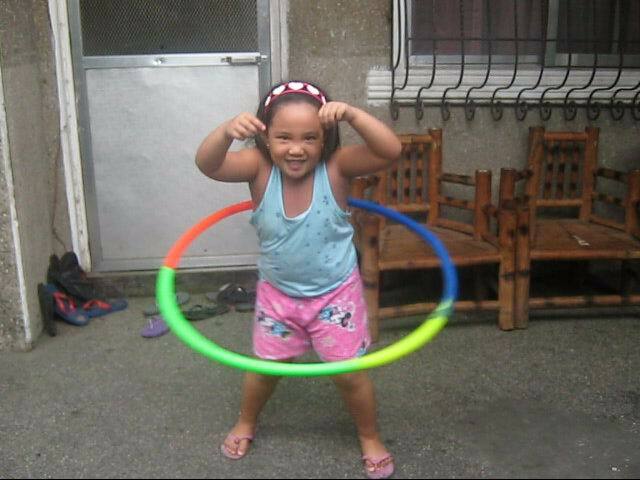 And here she is with her hula hoop. She can make the hoop stay as long as possible and she does it very well. 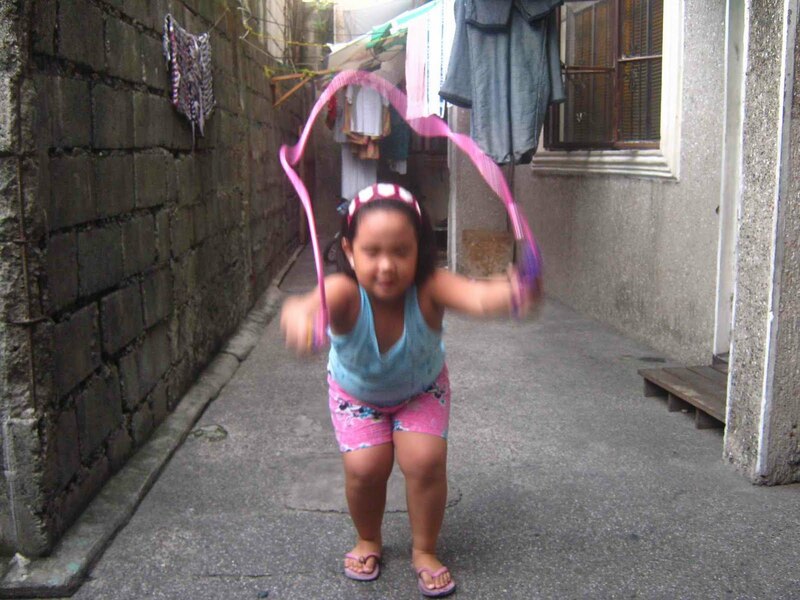 I, on the other hand can''t make the hula hoop stay on my hips longer than two spins! I guess she takes after her dad's dancing skills while I can't dance to save my life! I hope that these exercises can help shed some of her baby fats. We also moderate her eating and has discouraged her from eating junk foods and chips by not letting any in the house. We also do not drink any softdrinks or sweet juices. I just hope that these efforts are enough. Do you have any tips? Please do share. I am mother of three kids, one of which is 13 years old and I want to honestly say that I don't understand what he is learning in school anymore! I am sorry to say that I am no help to him when it comes to his homework and lessons. When I was in school, I understand the concepts of a probability calculator, equivalent fractions, prime factorization and the like. But having learned these concepts 15 years ago and having no reason to use them in real life or in my line of work, they are now just vague ideas to me. I can no more tell my son what a line plot is, let alone teach him linear programming. I can still remember what an isosceles triangle and a bar graph is, but I still cant teach him to solve the formulas and problems. I know that I need to get tutors for my son to give him some help that I cant provide. And I am not talking about getting just any tutors: I meant getting an online tutor to make the learning experience fun and exciting for him. Kids love to play with computers and giving him an interactive teacher would stimulate his interest for the lessons at hand. I can teach my son history and English but Math concepts are now alien to me so I think those are the lessons that I need to get for him. Good things online tutors like Tutorvista.com are just a click away! They even offer free trials that I will sure check out now. While others are excited about Christmas, I am more excited about Halloween and the costume possibilities for my kids and myself. I have three kids to dress for their school party and I would love for them to be sparkly vampires! Yep, mommy loves Edward and Bella and my kids are game to dress up as them. I have been watching the movies to check out the costumes that would make them look like cool, sparkly vampires and I found some Halloween Contact Lenses to add to the touch! Aside from making them wear the costumes to their school party, I would also love to dress up with them and visit some malls with Halloween contests. We could come us a vampire family, complete with the indifferent attitude and win us some prizes! It would be a good, memorable and fun family activity. I just wonder if we should dress my husband as a vampire or as a werewolf. Ha ha, endless possibilities indeed and that is what I love most about Halloween. I would also love to attend some blogger events with themed costumes for couples. It would be fun to do something as mindless and cool as this! 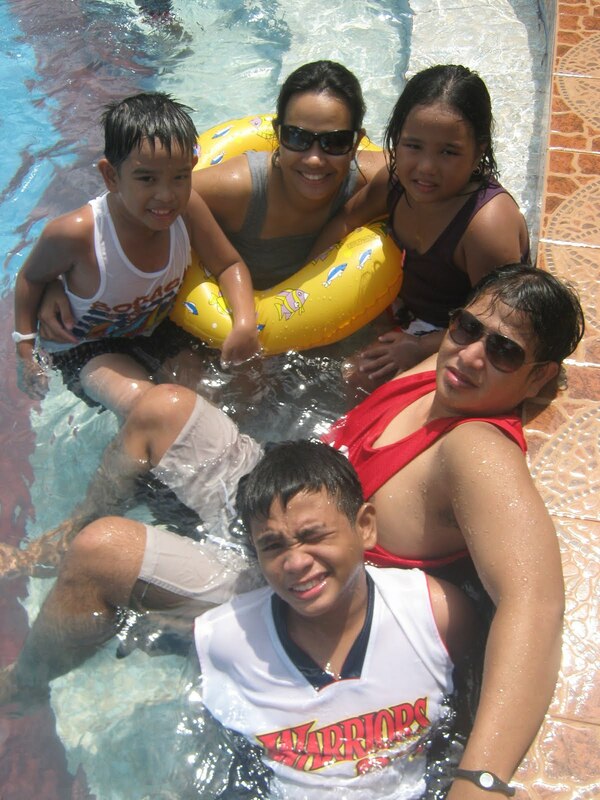 We love swimming and here is a family picture that shows a family that swims together, stays together!